OracleVirtualBox vs VMware Performance Comparison 2019 – Everything can happen today as technology is getting more sophisticated. In the past, people simply think that a single computer can only use single operating system. There is no way a computer can handle more than one operating system. But today, people should make up their mind because breakthrough has come to change everything. A single computer can use multiple operating systems! Thanks to the so called virtual machine that brings it into reality. Actually there is bunch of software available when it comes to virtualization, two of which are VMware and VirtualBox. 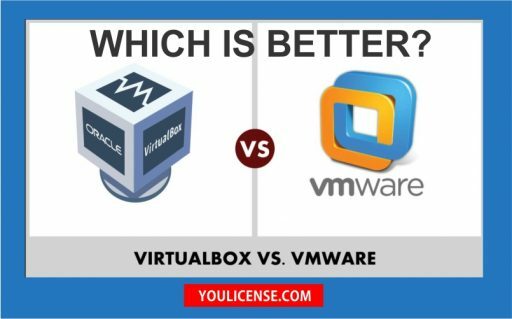 Comparing VirtualBox vs VMware 2019 helps you find which one is better. In case you do not really get the point, it will be better to talk about the virtual machine and virtualization first. The term virtualization refers to creating virtual version of certain thing. In this case, virtualization allows you to create the virtual version of operating system. In short, you can find out the performance of certain operating system by making virtualization. This virtualization is performed by the so called virtual machine. It is computer architecture-based machine that provides the functionality of real computer. In simple words, this machine is able to create the same environment as a computer has. It enables you to run the operating system without even replacing the current OS on your PC. Why Oracle Virtualbox vs VMware? There are many tools which you can use to create a virtual environment on your pc. The top players in the market are VMware and VirtualBox. But, which one should you use? It is a very difficult question. You need to consider a lot of factors before choosing any virtual machine. There are many cons and pros of both the tools. In this article, we have covered all the important factors. We will tell you about the price, performance, security, data transfer speed, compatibility, and license about both the tools. As aforementioned, there are several choices of software that work as virtual machine. However, VirtualBox and VMware are two applications that will be revealed here. To get deeper into the performance of each, the pros and cons will be examined on VirtualBox vs VMware 2019. To begin with, VirtualBox is known as an open source and is available both for individual and business use. Being open source means this software welcomes any addition to improve the program. Meanwhile, being a free program for Windows, you have to purchase a permit in case you want to use on Mac though. About the performance, VirtualBox is considered better to perform in the host operating system and guest operating system. To get further on VirtualBox vs VMware 2019, VirtualBox allows you to run more than single virtual machine at one time while VMware can only run single virtual machine. About the practicality, VMware is quite easy to operate. However, both of them will give you their best performance with the support of powerful PC. Before enjoying the features, surely you have to download, install and setup the software on your PC. Here you will find how to install and setup both of software. Begin with VirtualBox, you need to download the software and install on your PC. After finishing the installation, open the software and click New to create new VM. Enter the desired name then select OS version and type. On the same window, you will see Expert Mode button. Click this to select desired RAM size and create virtual disk. In case you click Next button on that window, you will also have the same choice to choose the RAM size and create virtual disk. After creating the VM, click start to run the virtualization. Right after clicking start button, you have to select the ISO file. Select the file and run the operating system on your VM. Meanwhile, it is very easy to install and setup VMware virtual machine. After downloading, install the software on your PC. While installing, it is recommended to disable Windows Defender. After installing VMware, open the application and you will see VMware window. Choose the option to create new virtual machine. You will have 3 options. In case you have ISO, choose the second option. Browse for the ISO file and click next. Enter the desired name and click next. After entering the name, you have to enter the disk size. Finally, you will come to setup page that allows you to customize the hardware option. You are allowed to select RAM for operating system, network adapter, processor, display, and other. When it comes to VirtualBox vs VMware compatibility, VirtualBox is compatible for Windows, OS X, Solaris and Linux. Meanwhile, VMware compatibility is a little bit fewer than VirtualBox. VMware is only compatible for Windows and Linux. The large company that backs VB is Oracle, which isn’t terribly FOSS friendly. 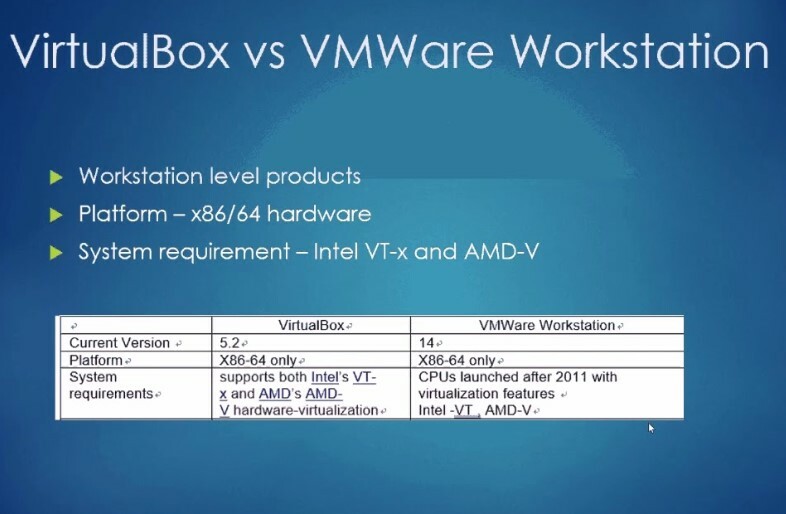 VirtualBox vs VMware 2019 have different characteristics, making them has their own fans. When it comes to determining which one is better, it is actually talking about the good and bad sides of each. In case you need to make virtualization for company, VMware is much recommended. Aside from the availability of pro versions, this virtual machine is reliable. Monthly updates are available for this software. In case you want to test multiple operating systems at once, VirtualBox comes to the front. This virtual machine enables you to run several operating systems in one time without problem. Considering this software is an open source, you can get updates quickly. Even if you find any buggy updates, it can be fixed right away. VirtualBox is available for anyone as it can be downloaded for free, on the other hand VMware requires you to pay. Therefore, if you are looking for free software that can be updated frequently, VirtualBox suits you best. However, in case you wish to have premium virtual machine software, VMware will be suitable. After revealing the good and bad sides of each virtual machine, you can now decide which software will work best for you. In conclusion, both of software can give best performance for virtualization, even though they have different characteristics. VirtualBox vs VMware 2019 helps you get clear image of virtual machine you are going to use for your personal computer. Virtual Machines help you in using different operating systems without booting them. If you are not using them, then you need to dual-boot your computer. Your computer will become very slow after dual-booting. Hence, dual-booting is not preferred. In fact, you can run many different operating systems on top of your original OS. If you have enough disk space available, then you can install new operating systems. It is also very difficult to dual-boot your computer. Hence, using Virtual machines is a better option. Virtualbox is used to operate a virtual machine on the computer. It is completely open source. Thus, you can get this software for free. It was first created and licensed by Microsystems license. But, now it has become a part of Oracle. You can also buy a paid version of Virtualbox. There are many more features available in the premium version of VirtualBox. Before discussing the features of both tools, it is important to know about their history. Hence, we are going to discuss both tools history. Virtualbox was created by Sun Microsystems in 2007. They decided to make it open-source. Thus, everyone can download it for free. It was bought by Oracle in 2010. After that, every tool was not open-source. You need to buy a license for some tools. But, Virtualbox got its popularity due to Oracle. They added many missing features in VirtualBox. Hence, it gained popularity very fast. On the other hand, VMware is the oldest virtual machine tool. It was launched in 1998. There are currently more than 20000 employees working under VMware. Thus, you will get very frequent updates on this software. But, this tool is limited to personal use. You need to buy a license if you want to use it for commercial purpose. In recent days, companies have started making different categories of their product. There are many different categories available like basic, personal and commercial. Hence, it is important to discuss these different versions. First, we are going to discuss the pricing of both tools. As we have already mentioned before, VirtualBox is an open source tool. Hence, it is very to use. But, Oracle has upgraded the software by adding a lot of new features. These new features are not available for free users. If you want to use these features, then you need to upgrade to the premium edition. However, the free version is perfect for educational, non-profit and personal use. Thus, a lot of people love VirtualBox. They can easily use this software for their own personal use. Similarly, you can use VMware for free. But, the free version is available for personal use only. You can’t use it for commercial purpose. If you want to use it for commercial purpose, then you need to buy a license from VMware. VMware is perfect for those users who want to get a license at a low price. Their pricing is slightly lower when compared to VirtualBox. If you want to use this tool for educational purpose, then you don’t need to pay any charges. You can directly download it from their official website. Now, we are going to talk about the installation process. It is another very important factor because installing an OS is a very hard task. You are going to run at least two operating systems on the same device. Hence, the installation wizard will help you in creating the partition in your computer. You have full control over this partition. You can choose what amount of hard disk will be allocated to the new operating system. But, VMware interface is very easy to operate. Even a new user can use VMware to run multiple operating systems. Both of these tools have amazing performance. Virtualbox installation file is very small when compared with VMware. You can install older operating systems in this virtual platform. They will work very smooth with excellent performance. If you are having an old PC, then VirtualBox is perfect for you. VMware is made for new computers. You need good specifications to run VMware on your pc. If you need a good amount of RAM in your computer. Also, you must have a graphics card installed in your computer. Hence, it won’t work on old computers. Also, you can’t run old operating systems on VMware. If you want to run old operating systems, then VirtualBox is better. Otherwise, VMware is better for the new operating system. VMware has better performance when compared with VirtualBox. You can easily run multiple operating systems in VirtualBox. The next important factor is compatibility. Most people want to install software which has the best compatibility. If you are a developer, then this factor becomes more important for you. VirtualBox has been updated many times in the past. Its latest version is very reliable. Both of these tools are compatible on MacOs, Linux and Windows. But, in terms of new updates, VMware is better. In virtualization, the virtual machine creates an isolated environment for the new operating system. You can’t access the files of your host computer from the new operating system. If you want then you can connect both the operating system. But, the process is very complicated. Also, it will affect the process of transferring data from one OS to another OS. VMware is very reliable when it comes to data transfer. Even they create an isolated environment for the new operating system. But, you can access the host computer using your new operating system. You can easily transfer files from your host computer to guest OS and vice versa. This is the reason why people prefer VMware over VirtualBox. You don’t have to worry about data transfer if you are using VMware. Security is another very important aspect. Both tools are very secure and safe to use. The best thing about the virtual machine is that you can’t access host OS using it. Hence, even if your virtual machine got hacked no one can access your host OS. Windows operating system is vulnerable to malware and virus. However, this won’t affect the process of virtualization. If you are using Linux in guest OS, then it won’t ever get hacked. Developers use these tools to test their new software. They run their software in all the operating systems. Hence, they will come to know about all the bugs. After that, they can easily fix bugs in their software. If you are running Windows, then you need to fix security bugs. If you are testing Android apps, then you can use emulators also. Emulators are used to run mobile operating systems on the computer. If you need Virtual machine for personal use, then both are reliable. You can download the free version of both the software. However, Virtualbox free version is a little better. But, you will get the entire basic feature in the free version. Personal use includes non-profit use and educational use. Students can download both of the software for free. They can use it for testing and learning process. If you need these tools for business use, then VMware is a better option. The paid license of VMware is very cheap. Also, they have added many different features in their paid version. If you are doing research, then you can download their research extensions. If you have a small business, then you can download their business extensions. These were all the factors which you should consider before selecting the perfect tool for you. There is no simple answer to this question. You can try these tools and find the perfect tool for you. Both of these tools have paid and free versions. Moreover, both of these tools are backed up by big corporations. VMware is backed up by Dell. On the other hand, VirtualBox is backed up by Oracle. There are several more factors which are relevant for the virtual machine. You might have heard about cloud computing and emulators. Both look very similar to the Virtual machine. But, they have very different functions. We will talk about both of these technologies. The virtual machine is used to run a different operating system. It creates a completely isolated system in the host computer. The host computer provides hard disk space to the virtual machine. All the other operations are performed independently on the virtual machine. But, the emulator is used to emulate an operating system. It is depended on the host computer. You can use it to turn your device into some other device. For example, you can use Android emulators to turn your computer into an Android phone. Hence, you can run Android apps on your pc. Similarly, you can run Console emulators on your pc. Hence, you can play console games on your pc. Cloud computing is a very new term. Most people don’t understand the meaning of cloud computing. When you open Facebook, you can write and post pictures on it. These features are provided by Facebook only. Your computer has no role in providing these features. The working system of the cloud is also the same. It is used by advanced users to perform complex tasks. You can perform multiple operations on someone else computer. Your computer resources won’t be used to perform these complex operations. All you need is a working internet connection. Emulators and cloud computing are very closely related. But, still, they are used for different purposes. You can’t use cloud computing to emulate a platform. Similarly, you can’t use emulators to store your important data. It is important to know the difference between both the terms. Thoughts on "VirtualBox vs VMware Performance Comparison 2019"